Make it Fun: This is always important when serving up kids healthy snacks. Try using fun shaped cookie cutters, serving kabobs or providing dips and other interactive foods to keep kids engaged. Choose Store Packed Snacks Wisely: Sometimes packaged foods can be high in fat and sodium. Be sure to look closely at Nutrition Fact Labels. Go for the air-popped popcorn, whole-grain tortilla chips with salsa and guacamole or whole-wheat pita bread with hummus. Build a Colorful Vegetable Tray: Putting colorful veggies like grape tomatoes, baby carrots, steamed and chilled green beans and cauliflower florets in fun shapes can be more appealing to little fingers. Including a variety of colors ensures that the kids are getting a range of nutrients. Include a Filling Main Event: Try a healthy homemade pizza party! Start with whole wheat pita bread or tortillas for a simple crust. Provide lower-sodium marinara sauce, low-fat cheese, turkey pepperoni and plenty of fresh vegetables, and allow the kids to add their own toppings. Serve a Better Drink: Instead of soda or other sweetened beverages, serve 100% fruit juice or jugs of ice water with fresh fruit, like strawberries, oranges or lemons. Be Smart with Sweet Treats: Serve more nutritious foods first, and bring out the sweets later when the kids have already filled up on healthier fare. Provide smaller portions of desserts and treats, and serve each child individually, rather than leaving sweets out for the taking. Smarter options include fruit- or yogurt-based popsicles. Kristin Harris is a Registered Dietitian with Kids Eat Smart Foundation. http://www.kidseatsmart.ca/wp-content/uploads/2018/07/KidsEatSmartColour_Logo_340x156-300x138.png 0 0 admin http://www.kidseatsmart.ca/wp-content/uploads/2018/07/KidsEatSmartColour_Logo_340x156-300x138.png admin2015-02-26 20:03:572015-02-26 20:03:57Healthy Party Snacks! http://www.kidseatsmart.ca/wp-content/uploads/2018/07/KidsEatSmartColour_Logo_340x156-300x138.png 0 0 admin http://www.kidseatsmart.ca/wp-content/uploads/2018/07/KidsEatSmartColour_Logo_340x156-300x138.png admin2015-02-26 19:44:462015-02-26 19:44:46Healthy Party Snacks! Adding Veggies to Your Breakfast! Colorful Scrambled Eggs: It’s always nice to have some warm eggs to start your morning off on the right track. Eggs are protein packed and energy filled! Adding peppers, diced tomatoes and mushrooms are a nice colorful addition to add to your eggs in the morning. Veggie Filled Breakfast Sandwich: Adding veggies to your whole wheat English muffin can be quick and easy! Spinach, tomato, cucumber, low fat cheese and egg is a delicious way to have a well balanced meal to start your day. Fibre Filled Low Fat Muffin: Adding grated carrots or zucchini to an already delicious low fat muffin can give you that extra fibre you need in the run of a day. Breakfast Burrito Wrap: Wrap up your Colorful Scrambled Egg recipe from above in a whole-wheat tortilla wrap – add some cheese and you have a yummy breakfast treat! Sweet Potato Hash: Grate the potatoes, place in a glass bowl to microwave for about 3 minutes. Heat a skillet or frying pan and then fry the potatoes with a small amount of olive oil until crispy. Add some grilled peppers for a colorful mix. Kristin Hedges is with The Kids Eat Smart Foundation. http://www.kidseatsmart.ca/wp-content/uploads/2018/07/KidsEatSmartColour_Logo_340x156-300x138.png 0 0 admin http://www.kidseatsmart.ca/wp-content/uploads/2018/07/KidsEatSmartColour_Logo_340x156-300x138.png admin2015-02-24 18:33:222015-02-24 18:33:22Adding Veggies to Your Breakfast! 1. Design it yourself – Choose whole grain, extra veggies, low fat milk products, low fat sauce or dressings. (Kids love to dip). 2. Salad savvy – Ask for salad dressing on the side, choose leafy green salads and skip the croutons and bacon bits. 3. Drink smart – Water is the best choice to quench your thirst; choose water or milk with your meal when eating out. (Kids love to eat from fancy straws so ask your server if they have one). 4. Breakfast basics – Choose healthier options such as oatmeal, fruit and yogurt cups or whole grain bagels with peanut butter. 5. Fill up on fibre – Choose menu items made with whole grain breads, lots of vegetables or fruit, and legumes. 6. Desserts – Fresh fruit, plain frozen yogurts and sorbet are healthier options. 7. Get the facts – Ask for nutrition facts at the restaurant before you order, most restaurants also have them online so you can decide what you want before you go and be the first to order! Kristin Hedges is a Dietitian with Kids Eat Smart Foundation. Breakfast for Supper – Pancake Day! Today is a day we all get to enjoy breakfast for supper. It’s always important to include all of your Food Groups so why not add veggies to your pancakes. Serve with some yogurt, berries, and scrambled eggs and you’ll have a well balanced meal. Check out this unique pancake recipe with your kids tonight! Add cauliflower and 1/2 cup to a food processor and blend until smooth. Cauliflower puree, coconut milk, and egg. In a separate bowl, combine whole wheat flour, sugar, baking powder and salt. Fold wet ingredients into the dry ingredients and mix until all incorporated. Add 1/4 cup water to thin out pancake consistency. http://www.kidseatsmart.ca/wp-content/uploads/2018/07/KidsEatSmartColour_Logo_340x156-300x138.png 0 0 admin http://www.kidseatsmart.ca/wp-content/uploads/2018/07/KidsEatSmartColour_Logo_340x156-300x138.png admin2015-02-17 18:25:412015-02-17 18:25:41Breakfast for Supper - Pancake Day! No need to get complicated when thinking about themed meal ideas – color can be as creative as we need to be! 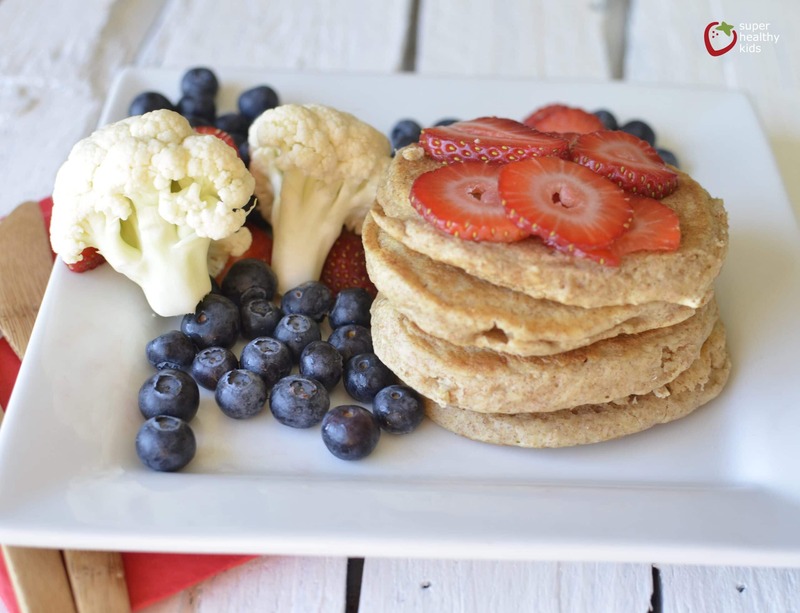 Serve up a variety of red foods for Valentine’s this week during your Kids Eat Smart Breakfast Club! Celebrating Heart Month in February! http://www.kidseatsmart.ca/wp-content/uploads/2018/07/KidsEatSmartColour_Logo_340x156-300x138.png 0 0 admin http://www.kidseatsmart.ca/wp-content/uploads/2018/07/KidsEatSmartColour_Logo_340x156-300x138.png admin2015-02-05 19:16:542015-02-05 19:16:54Celebrating Heart Month in February!